Rent Stabilization 101: Am I Rent Stabilized? No, you are not. There are actually no rent stabilized people anywhere in New York. There are no rent stabilized tenants. Not a one. There are no rent stabilized buildings in New York either. Blasphemy you say? OK, a fun legal distinction perhaps. But remember, rent stabilization is an objective analysis, using the law, to determine the status of an apartment unit. Not the status of a person, not the status of a building, but rather, the status of an apartment and nothing else. There is no official list of rent stabilized apartments. Apartment registrations don’t count because the registration, or failure to register, does not decisively conclude the objective determination. Instead, there is merely a nebulous cloud where, in theory, all the rent stabilized apartments of New York should reside. If the tenant is lucky, the owner or landlord will clearly convey that status to a tenant. And that’s why there is no official list; rent stabilization law exists in theory, and it’s usually up to the tenant to figure out whether the pieces apply to their apartment. And the theory goes like this. There is a presumption of rent stabilization if a building was completed before 1974, and has six (6) or more units (whether in the past, or currently). It’s up to the owner to rebut that presumption. There’s another part of the theory, and that’s when an apartment is rent stabilized thanks to a property tax benefit, or through a land use action. In all, that means there are at least three different ways an apartment can achieve rent stabilized status. Once the apartment is in the rent stabilization club, regardless of the avenue taken, the tenant benefits from the same rights and remedies as any other tenant in a rent stabilized apartment (other than high rent vacancy deregulation, but that’s another story). Knowledge is power, it cannot be said enough. The lack of knowledge hurts affordable housing just as much, if not more so, than the most nefarious building owner. So the first place to look for your apartment’s status is your lease, if you have one. Not having a lease does not change the rent stabilized status of your apartment. Either it is, or it is not. If the owner is playing by the rules, a tenant of a rent stabilized apartment should receive a vacancy lease, or a renewal lease, and a rent stabilized lease rider. The vacancy lease is the first, or initial lease, between the owner and the tenant. You may get lucky, and the lease may clearly state the apartment is rent stabilized. Or the lease might claim otherwise, and clearly state the apartment is not rent stabilized. But the lease an owner purports is not the final word, since an apartment’s rent stabilized status is an objective analysis (not the owner’s analysis). When the lease term of the vacancy lease nears its end, between 150 and 90 days, the owner is legally required to offer the tenant a renewal lease. This lease is just a page, and is based on the same terms and conditions as your prior lease. Did the vacancy lease state you’re entitled to parking space? Then that right carries over in every renewal lease. However, there are two terms and conditions that can change, the lease term, and the legal regulated rent. Any other change, in general, to the terms and conditions requires an application to the DHCR. Vacancy and renewal leases are required to convey certain information to the tenant (lease term, rent per month, contracting parties, etc. ), but in the real world, these documents are often unclear regarding the apartment’s status. Subsequent to the Rent Code Amendments of 2014 s, owners are required to include a particular type of rider colloquially known as the “rent stabilized lease rider.” If the tenant should happen to have one, this rider communicates the apartment is rent stabilized. The rent history of an apartment is a great instrument and just might tell you all you need, so long as you live in the apartment in question. If the lease gives no hint as to the rent stabilized status, the apartment history might. With luck, the owner of the building may have already registered the apartment for your lease term, or a prior tenant’s lease term. If you want to know the status of an apartment you’re thinking of renting, the rent history won’t be available to you for privacy reasons. This method will also be meaningless if the owner never registered the apartment. DHCR rent history is available either by visiting a rent office, by mail, by phone, or by online form. The easiest way is to visit an office. If there’s no history available for the address, that means the apartment has never been registered for whatever reason. The lack of a registration does not affect the rent stabilized status of an apartment. As always, it either is, or is not rent stabilized. Rent histories have their limits. Remember, apartment registrations, the data that generates the rent history report, is owner generated. In other words, just because a registration is missing, doesn’t mean the investigation is over. There are many additional databases available that can help. Head over to the DHCR’s building registration search engine. If the lease comes up with no answers, there’s no rider, and there’s no rent history (or you cannot access it), you can check whether the building has or had at least one rent stabilized unit registered with the DHCR at some point since 1984. This is a very broad search, because it’s not specific about individual apartments. And so it’s not uncommon for a building to have many apartment units registered as rent stabilized, but not every apartment. And the reasons for that may or may not be legal. It’s very possible, if not probably, that every step we just went through will find you no answers. Or maybe the lease will clearly state “apartment is not subject to rent stabilization.” The point is, the analysis doesn’t end there. It’s not unusual for building owners to intentionally obfuscate the status of an apartment. That brings us into the world of property tax benefits and land use actions. 421-a and J-51 are the two major property tax benefits that convey rent stabilized status to an apartment unit. 421-g does as well, but it’s a small program that’s limited to lower Manhattan. It works like this: the building owner receives a sizable reduction in property taxes in exchange for the benefit. In some cases, the tax is reduced to near nothing. In general, the building owner must treat the apartment units as rent stabilized. J-51 benefits are attached to buildings that undergo a substantial renovation, or converted into a multiple dwelling. 421-a benefits attach to new multiple dwelling construction. Unlike the uncertainty with determining the apartment status of a pre-1974 building, the question of status is easier to answer here. All apartments in a building currently receiving a J-51 property tax benefit are rent stabilized. In general, apartments in buildings that receive a 421-a benefit are usually rent stabilized, but more on that in Step 5. The challenge is navigating the New York City databases that will help answer the question of rent stabilization. The good news is that the answer is out there. We’ll cover the major NYC databases, all maintained by the NYC Department of Finance (DOF), the city agency responsible for administrating these tax programs. They include DOF’s property tax bill search portal, DOF J-51 Benefit History portal, and DOF’s property tax benefit portal. Although each one of these sites explain what property tax benefit attaches, each one tells a slightly different story. We’ll also look at a few others. But wait! 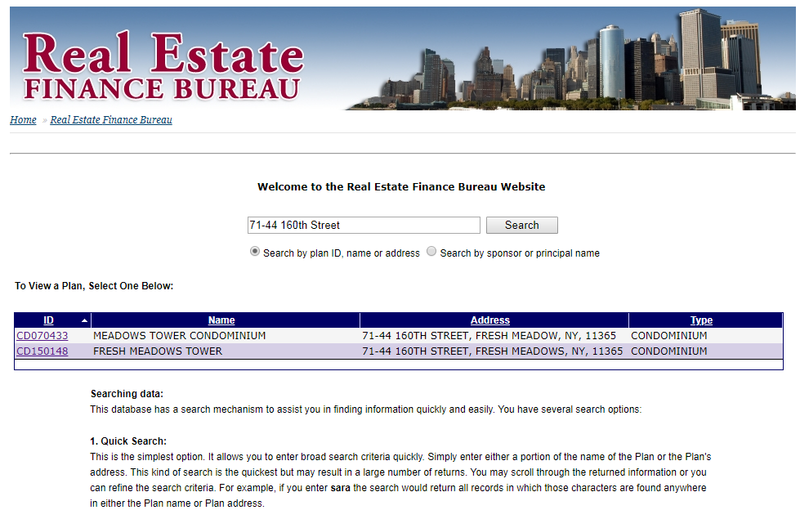 Before we begin we actually have to check another database, and that’s the New York State Attorney General Real Estate Finance Bureau (NYS AG REFB) website. So get this, a building can have a 421-a or J-51 tax benefit attached to the property, but not have any rent stabilized apartments. Why? Because co-ops and condos are exempt from rent stabilization. However, before a building can become a co-op or condo, the owner must have the approval of the Attorney General’s office. And that information is publicly, and instantaneously, available on REFB’s search portal. Click here for the NYS AG REFB’s search engine. We could probably write an entire article on this search portal alone (and probably will!). The point is to find whether your building’s address appears. Make sure to keep the search broad. It’s better to search the street name and then narrow towards the specific address just to ensure you’ve exhausted any chance the building has a co-op or condo filing that was approved by the Attorney General. But just because the address in question comes up, doesn’t mean the analysis ends. Case in point, try a search for “71-44 160th Street”. There will be two results, and for good reason. Two results for one address, which is not unusual. At first glance it appears this property is a condo. 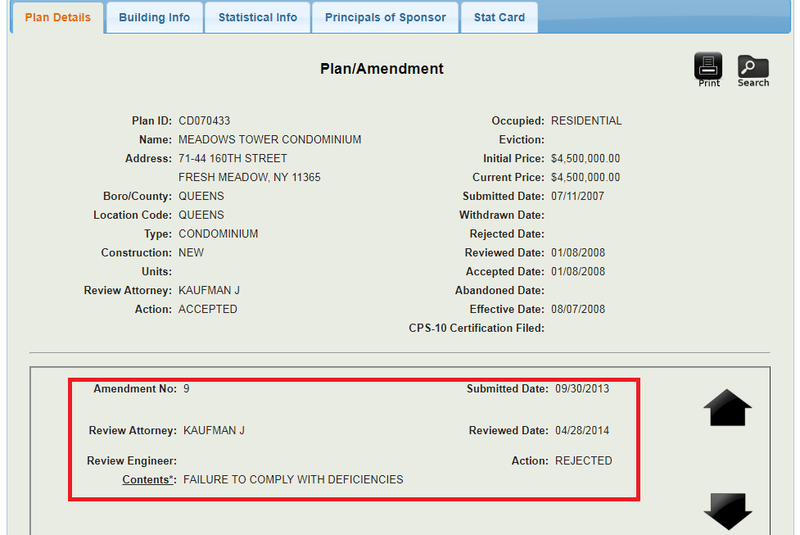 But the marking “Failure to comply with discrepancies” and “rejected” are ominous signs for this condo project. If we search “71-44 160th Street” on the Attorney General’s general website search page, the address appears again, this time part of enforcement action against the owner for fraud. As it turns out, the owner was supposed to treat the building as a condo, but instead rented the apartments, coupled with a 421-a benefit. Those two combinations means rent stabilization. I suspect the AG’s office rejected the second filing due to the alleged fraudulent behavior. Conclusive answers regarding the status of a co-op or condo filing won’t always be so neatly wrapped up like the above address. And the website is not particularly user friendly, even if you have a law degree. Thus a general search on the AG’s website may not always be helpful, and often times, it won’t. But the REFB’s search engine should always be part of the analysis. It’s important to note the example used is just one of the many variations of possible issues you may find with buildings that pretend to be a co-op or condo. Just because the owner says it is, doesn’t mean it is. 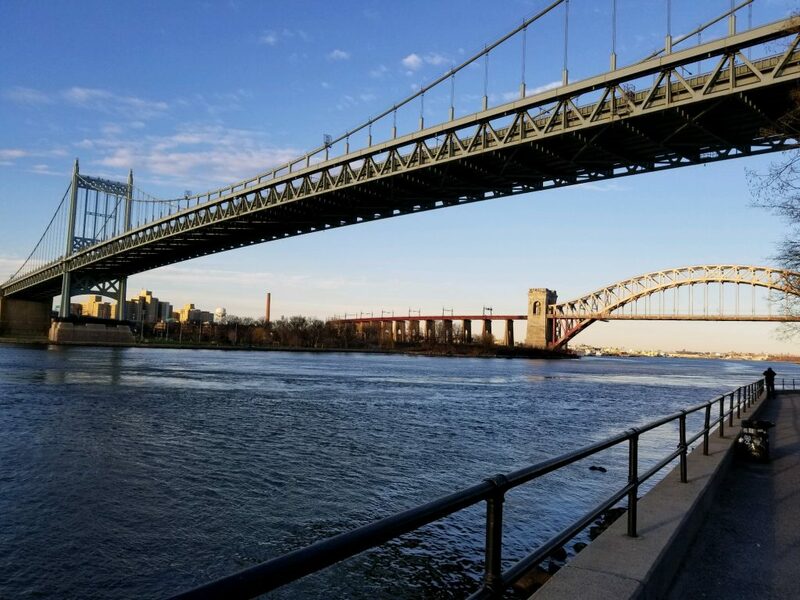 The DOF maintains a searchable database that provides access to every building’s property tax bill in the five boroughs. 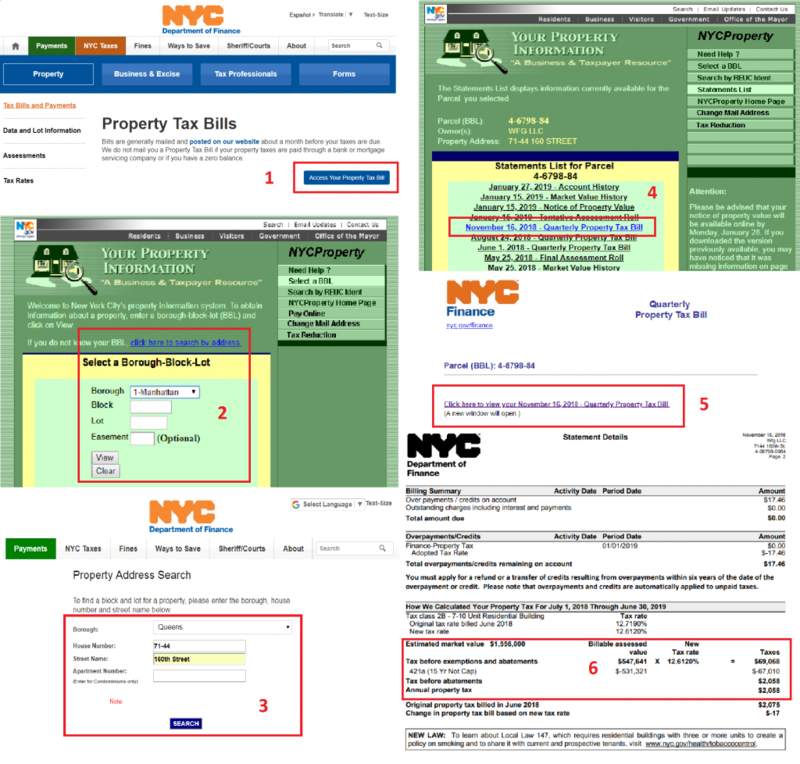 You can look up any property in NYC and see the details of the property tax, such as how much the property owner pays in property taxes per quarter, and whether there is a property tax benefit attached to the property. This portal offers an immediate answer to whether the owner is currently receiving a J-51, 421-a, or 421-g (if you happen to live in lower Manhattan). If the building in question isn’t a co-op or a condo, the apartments in the building are definitely rent stabilized if J-51 benefits are attached, and likely rent stabilized if a 421-a benefit is attached. We have to hesitate when speaking about rent stabilized status and 421-a benefits. Under the new 421-a, known as “Affordable New York”, not every apartment in a 421-a building is rent stabilized. Prior to 2016, under the old 421-a program, every unit is subject to rent stabilization, even if the initial rent is above the high rent vacancy threshold. There were some limited exceptions for affordable housing programs, but these were isolated examples. This is not the case under the new 421-a. Like the old program, there are several different varieties of benefit available, but the program only requires 25% to 30% of all apartments to be rent stabilized (however, for a longer 35 year period). We’ll have to review the regulatory agreement (see step 8) for more evidence. Using the same address used above as an example, searching the DOF property tax bill website will reveal any current property tax benefits. Here, the address receives a 421-a benefit. Steps 1-6 to navigate property tax records. Enter the borough, block, and lot number (BBL), or the address. If you don’t know the BBL, click “search by address” to use NYC’s BBL to address converter page. NYC’s BBL to address converter page. Enter the address if you don’t know the BBL. Click to view property tax bill. And there’s the proof that the property receives a 421-a tax benefit, with a large tax benefit that nearly eliminates the property owner’s quarterly property tax. The DOF maintains a “searchable” historical archive of J-51 data dating back to fiscal year 1972/1973. In perhaps the most user unfriendly way possible, this website will help answer whether the property in question currently receives a J-51 property tax benefit, but much more importantly, whether the property received a J-51 benefit in the past. This information is important because J-51 is a bit different than 421-a. J-51 analysis can get very complications for a few reasons. First, there are many J-51 buildings that were already rent stabilized to begin with. So you’re adding another layer of rent stabilization on top of a building that already has rent stabilized units. That has the effect of either returning units to rent stabilization, or ensuring that apartments that are close to the high rent vacancy threshold remain rent stabilized. If the building’s apartments were rent stabilized prior to the J-51 benefit, the building’s apartments remain rent stabilized after the benefit expires. Therefore, if you moved in prior to the expiration of the benefit and have not relocated, the apartment remains rent stabilized after the J-51’s expiration. If you moved in after the expiration of the benefit, the apartment in question might still be rent stabilized. After expiration, all normal rules of deregulation apply, including high rent vacancy, so you’ll need to do a legal regulated rent analysis. If the building’s apartments are, or were, rent regulated solely due to the J-51 benefit (typically applies to post 1974 buildings), different rules apply. The building owner can only deregulate after J-51 expiration so long as every tenant received a J-51 lease rider with every vacancy and renewal lease. This rider must explain, in 12 point font or larger, the terms and conditions of the J-51 benefit, including when the J-51 benefit will expire, and clearly explain that the rent regulated status of the apartment will end once the benefit expires (but not before the end of the lease term). Even if the owner misses one lease rider, the apartment will remain rent stabilized until the tenant moves out. We can conclude then the historical record will benefit the tenant that falls into category one (1) the most, but category two (2) tenants will benefit if the building still has a benefit attached. Let’s figure it out, using a random property we grabbed from the HPD (Housing Preservation and Development) J-51 rolls. J-51 come in three varieties. J-51 benefits can be an exemptions, an abatement, or both. Here, there is no exemption associated with this property. With an exemption, the property’s value is theoretically reduced significantly for tax purposes, resulting in a much lower property tax. However, there is an abatement. Abatement is a discount on the yearly property taxes owed. Here, the owner’s yearly taxes are $25,834.44, reduced by a $2,019.08 J-51 abatement, resulting in a yearly property tax of $23,015.36 – a modest reduction. The fiscal year begins on July 1 of every year. Here, the J-51 benefit started in the 3rd quarter of fiscal year 2013. This should appear on the February 2014 tax bill. The property owner is receiving a 90% abatement on the total “alteration cost”, which should last 20 years. But usually, that money runs out well before the end of the abatement period. That $2,019.08 abatement is applied to this year’s property tax bill, with 10,701.16 in abatement funds remaining. Remember, just because the results may show no J-51 benefit now, it doesn’t mean there wasn’t a J-51 benefit in the past. Check as far back as you need (limited to 1972/1973) to investigate the status of an apartment. The wise tenant or practitioner will know how to navigate and manage the multitude of NYC websites, but there are a few shortcuts you can take in the meantime. The first is WhoOwnsWhat.JustFix.NYC, a terrific website that will, among many other things, automatically link you to the building’s DOF property tax bills. The problem though, is that DOF’s property tax bills only go back to about 2012, so historical information on J-51 benefits will require research (see step 6). The same is true for 421-a, to some extent (see following paragraph). 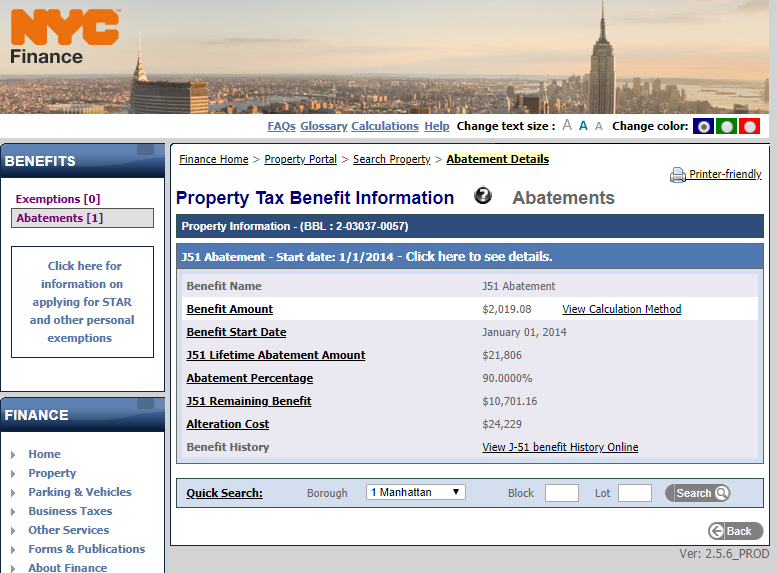 The second is the DOF’s Property Tax Benefit Portal. This website provides an instant snapshot into the benefits the owner of the property receives. 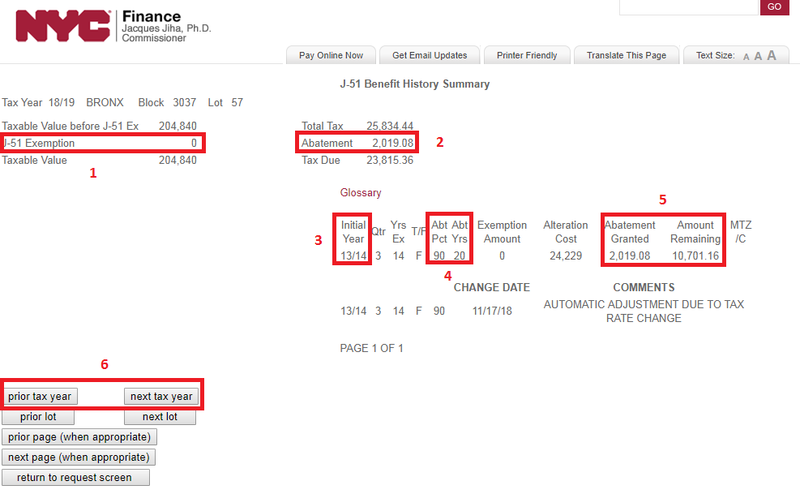 This website is helpful in determining when the J-51 and 421-a benefits begin and end. The shortcoming of this website is that when the benefit ends, no historical information appears. Analysis into prior J-51 and 421-a benefits will require further research (see steps 5 and 6 above). Voluntary Inclusionary Housing: certain areas of the city are zoned in a way that permit an owner to build at greater density, so long as a certain percentage of the apartments are “affordable” and subject to rent stabilization. Mandatory Inclusionary Housing: this type of zoning, as its name implies, compels owners to build “affordable” units that are subject to rent stabilization. 542 West 53 Street, New York 10019, as an example. 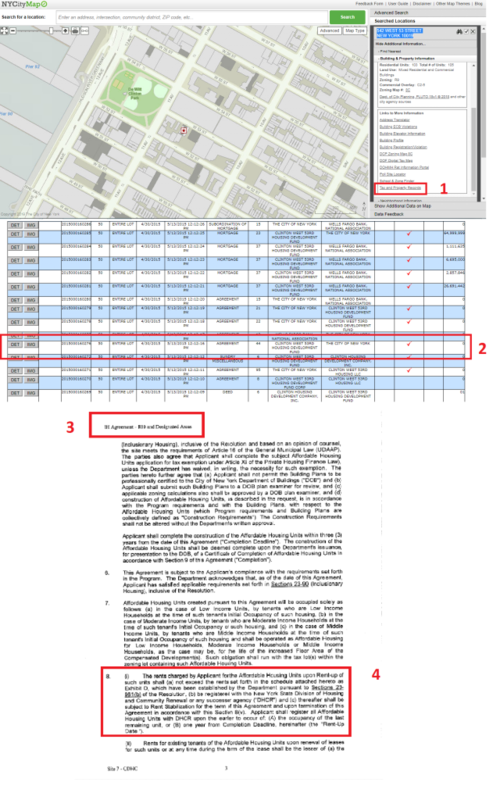 The NYC DoITT Map is an easy avenue to ACRIS, where an owner is required to file regulatory agreements, among many other types of real estate transaction documents. Once in ACRIS, it can be daunting to find the regulatory agreement and might take a bit of digging. Under “document type”, it may appear as simply “agreement” or “sundry agreement.” Unfortunately, there is no “regulatory agreement” document type designation on ACRIS! But there are a few other hints. The regulatory agreement will typically be larger than 15 pages, and be between the owner and a government entity, such as the City of New York. R-10 Inclusionary Housing – R-10 is the type of zoning district where you’ll find inclusionary housing. And there it is – on page 3, a regulatory agreement that conveys rent stabilized status to 102 apartment units (number of units conveyed on page 2). Keep in mind that regulatory agreements are filed for some 421-a building as well, and will outline (hopefully) the number of apartments that are subject to rent regulation. But they don’t always delineate the specific apartments like the example above. These 421-a regulatory agreements appear for special projects that are built in Geographic Exclusion Areas, and hopefully for “Affordable New York” projects as well (we haven’t seen any yet). Keep in mind all the analysis we reviewed is presented broadly. Unless we wrote a 300 page book, there’s no way to cover all of the minor idiosyncrasies that may alter the analysis. But this guide should get you started, and may help answer some questions. Good luck! Who Owns What in NYC?